Welcome to the AutoChart® LiveShare. We are glad to have you involved. 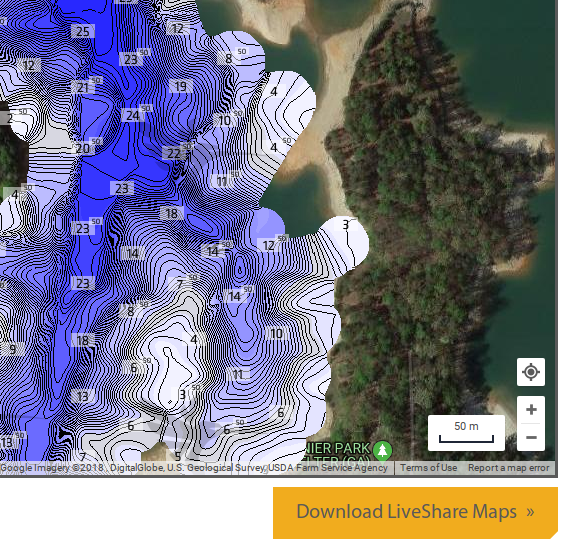 download their corrected data, combined with other map data collected and contributed by the LiveShare community, to an AutoChart Zero Lines Map Card for use in an AutoChart Live-compatible Humminbird fish finder . 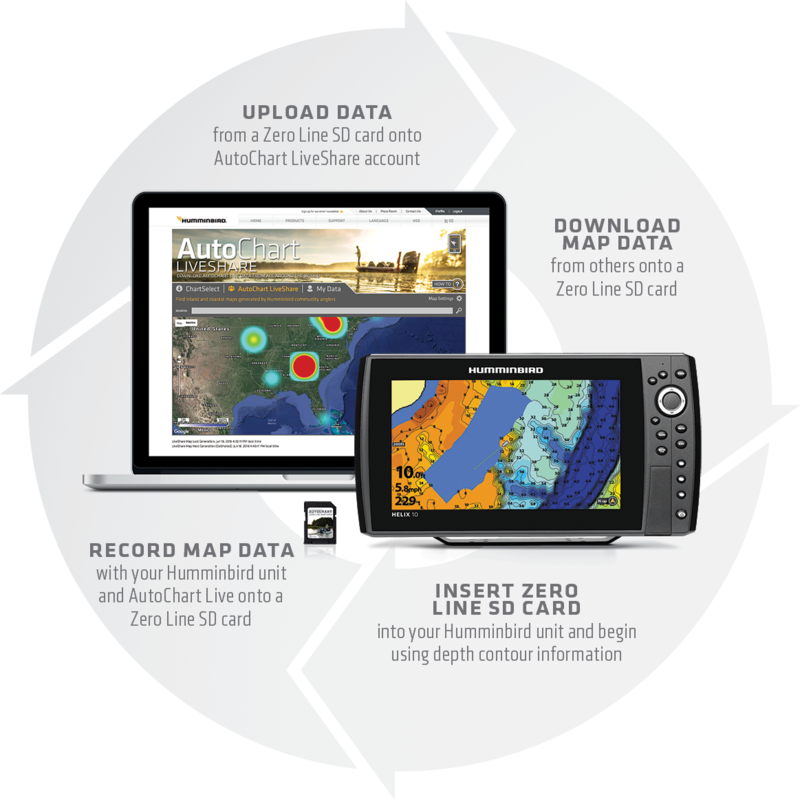 To use LiveShare, you will continue to save your AutoChart Live data to an AutoChart Zero Lines Map Card inserted into your compatible Humminbird fish finder. 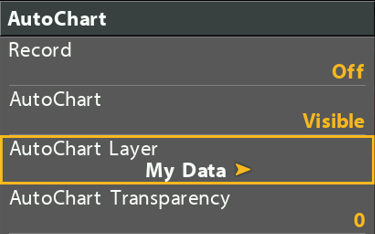 When you are ready to upload your data, insert the Zero Lines Map Card into the card slot on a Microsoft® Windows® or Macintosh® computer and upload the AutoChart Live data (.ACU files) to your ChartSelect LiveShare account. If you have an older fish finder, you can upload Humminbird Tracks (.HT files) or Humminbird GPX (.GPX files) instead of .ACU files. When you upload your AutoChart Live data, you can view your data in the online viewer on the My Data tab. You can view all LiveShare data (including your data) on the LiveShare tab. NOTE: Your uploaded data will be immediately available to view on the My Data tab, but there can be a delay of up to 15 minutes before it will become visible on the LiveShare tab. Use the following instructions to get started using AutoChart LiveShare. You can contribute to AutoChart LiveShare today – assuming you have previously recorded AutoChart Live files (.ACU), AutoChart PC files (.ACD), Humminbird track files (.HT), or Humminbird GPX* files (.GPX) on an SD card. Log in to your ChartSelect account. If you do not have a ChartSelect account, then you need to Register..
Click on the My Data tab. Click the “Share My Data” button to browse for .ACU, .ACD, .HT or .GPX files to upload. You will very quickly see your data appear as a map on the My Data tab. Within 15 minutes or less you should see that your data has been merged into the LiveShare map. Before proceeding, confirm you own a compatible Humminbird fish finder. Supplies: You will a blank 32 GB SD card. Follow the instructions to determine if you have the latest software version of your Humminbird Fish Finder, and if not, download the software to a blank 32 GB SD card and install it on your Humminbird Fish Finder. Warning! Humminbird is not responsible for the loss of data files (waypoints, routes, tracks, groups, snapshots, recordings, etc.) that may occur due to direct or indirect damage to the unit’s hardware or software. It is important to back up your control head’s data files periodically. Data files should also be saved to your PC before restoring the unit’s defaults or updating the software. See your Humminbird fish finder operations manual for details. Use the following instructions to download AutoChart LiveShare data to view on your compatible Humminbird fish finder. Log in to your ChartSelect account and click on the LiveShare tab. You will see a map of the world with a heat map showing you where there is LiveShare data. Locate your area of interest on the map. Click the + icon or roll your mouse wheel to zoom in until you see contour map data. Click on the Download LiveShare Maps button to download all the LiveShare data that is visible on the screen. Insert the AutoChart Zero Lines Map Card into the SD card slot on your compatible Humminbird fish finder. Press the MENU button twice. Press the RIGHT cursor key to select the HB Chart tab. Press the DOWN cursor key to select AutoChart. Press the RIGHT cursor key to open the AutoChart Menu. Selecting My Data will display only the AutoChart Live data you have collected on your Zero Lines Map Card. 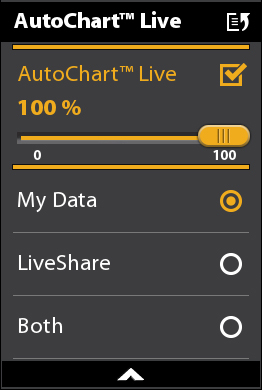 Choosing LiveShare will display only the AutoChart LiveShare data you downloaded from the LiveShare website. Choosing Both will display both the AutoChart Live data you have collected on your Zero Lines Map Card and the LiveShare data you download from the website. Tap the Chart menu in the upper left hand corner of the screen. Zoom in to the lake where you downloaded AutoChart LiveShare maps. Selecting My Data will display only the AutoChart Live maps you have collected on your Zero Lines Map Card. Selecting LiveShare will display only the AutoChart LiveShare maps you downloaded from the LiveShare website. Selecting Both will display both the AutoChart Live maps you have collected on your Zero Lines Map Card and the LiveShare maps you download from the website. Helpful Hint: Under AC Live Options, you can also turn on LiveShare Data borders. A red outline is displayed where you have downloaded LiveShare information. I Do Not Own an AutoChart Zero Lines Map Card. How Can I Participate in LiveShare? You can purchase a Zero Lines Map Card for download to your own blank 32 GB SD card on ChartSelect. Then follow the instructions here to program your SD card. I Own AutoChart PC Software. Can This Software be Used With AutoChart LiveShare? Yes. 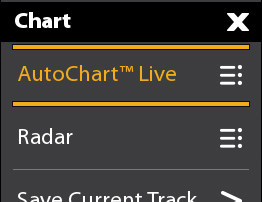 If you own a license for AutoChart PC, you can download the latest version with support for AutoChart LiveShare. You can also purchase a new license for AutoChart PC. I Notice That All Data I Upload Is Automatically Contributed to LiveShare and Shared With Other Users. Is There a Private Option? No. There is no private option.